There even were very severe thunderstorms in Berlin this morning, at 3:00. I was in Berlin Steglitz when the thunderstorm struck. Actually, I did not notice that the thunderstorm struck. But then I woke up, when a lightning struck my house. I managed to recieve the wetter online weather map, which is a combination of sattelite, radar, and detected lightnings that gets updated every 5 minutes, and it showed that there was extreme lightning activity. It sure was extreme, as light as day. Then the rain came. The rain poured down incredibly. It rained down 20Lm² in only 20 minutes! Very quickly a flash flood formed on the pavement, and on the street. On the street it grew 10cm deep. At the end of the street there is a "bowl". This "bowl" filled with 20cm deep water. Then the traffic light went out. In our street we have a deep construction sight, that is surrounded by a fence of wooden planks. Even though there were these planks, the water squeezed through and gushed into the construction sight, that filled with 1m deep water. I tried to find the weather warning of the german weather service, but the thunderstorm did not allow any radiocommunication. That was my experience this morning. 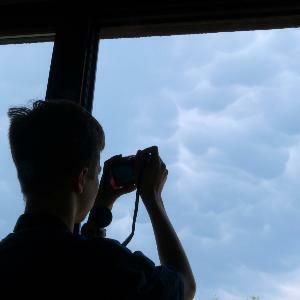 There were severe thunderstorms in large parts of the rest of Germany in the night, too. Strong rain, high lightning activity and of course large hail were the main factors in the thunderstorm. Locally there were up to 30Lm², which caused flash floods that flooded streets, and sweeped into cellars. A nother factor were stormgusts of 80-100kmh, which were not registrated by MILK in Steglitz. Trees toppled, branches fell, roofs and buildings got damaged there, where the stormgusts were registrated. 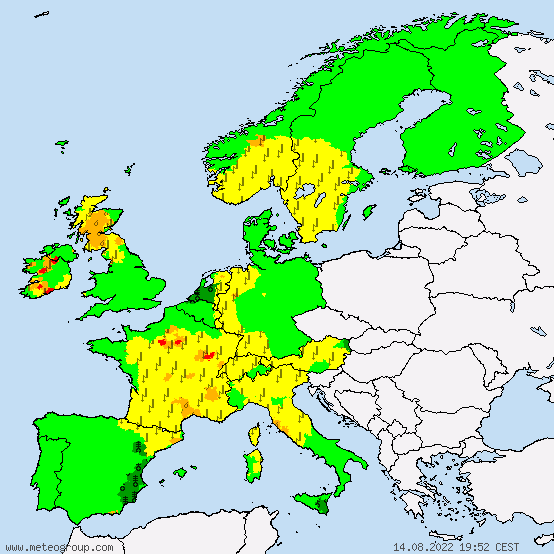 The most intense thunderstorms were registrated in a stripe from Nordrhein-westfahlen to the Baltic sea. This stripe was also affected most by the thunderstorms on Friday.